MAC Cosmetics has announced that there will be a Selena make-up collection coming in 2016 to honor the late Latin music icon Selena Quintanilla. Mac Cosmetics has collaborated with the hottest Pop stars like Rihanna, Lady Gaga, Nicki Minaj with their limited edition products. So this news is exciting to Selena fans across the world. Just this year fans celebrated and remembered the fallen starlet who was tragically killed 20 years ago. Also, July marked the 20th anniversary of the release of Selena's final album which was released 3 months after her murder in 1995. "Selena's talent and beauty, inside and out have, have left a colourful, meaningful impact in the world, that has continued to grow over the last two decades. We have heard the passion and enthusiasm from her fans and wholeheartedly agree that her legacy embodies MAC's philosophy." 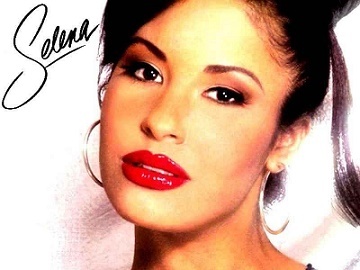 "I am so excited that MAC Cosmetics will be releasing a collection in honor of my sister Selena. Helping to create this collection brings me back to all those late night conversations on our tour bus when she spoke of having her own makeup line one day. If Selena were here she would be beyond ecstatic to have this happening. History is being made." SayWhatNews: Good morning Jeff. Thanks for sitting down and speaking with SayWhatNews. Tell us who is Jeff James? Jeff: I'm a stylist with a huge vision. I knew at a young age that hair was going to be my life. Growing up with a mother in the hair and beauty industry, as well as in my adolescence being a model myself became all I knew. SayWhatNews: Jeff, you are a Hair Stylist out of Houston, Texas. You mentioned your Mother was a Hair Stylist, so what exactly inspired you to become a Hair Stylist and how long have you been working in the Hair Industry? Jeff: I'm not originally from Houston, but I’ve been in the hair industry for about 10 years now, yet it feels like my entire life. Going to hair shows every year was always one of the most exciting times for me, I just knew it was only a matter of time. 1) Suede: anything Suede from shirts, skirts, pants, shorts, dresses and shoes/sandals. Suede is a great transitional piece that can take you into Summer. The key to rocking suede this Spring is to wear light colors. 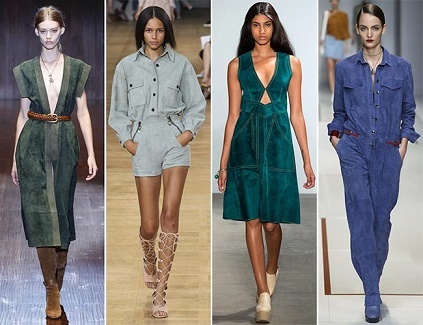 The styles of suede that rocked the runways were 70's inspired Suede, Hippie Suede, Bohemian Suede and Modern Suede. 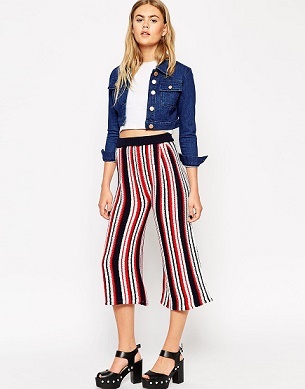 2) Culottes are back in style. From stripes to pleated to straight legged to flared. This 70's inspired look always seems to find its way back to the mainstream flow of today's Fashion. So, don't be afraid to rock this trend. Culottes are perfect for everyday wear, 9 to 5 and even after hours. Wear them proud and stay fashionably chic. 3) Light Weight Trench Coat - the perfect transitional piece to keep you warm during the cool Spring nights and still have you looking like a Pop star. Trench coats can be worn with anything from pants, skirt, dresses and even shorts. Every Fashionista needs to have at least two Trench coats in their wardrobe. Plus size model Grisel Paula debuts her Spring 2015 Ready to Wear collection. The model started her clothing line,'' Grisel'' last year and has since become one of the top favorites for Plus Size Fashionistas. Step 1: Begin with dry hair parted and combed the way you want it for the hairstyle. Step 2: Split your hair in 2 halves and begin by taking out a 1 inch section and clipping away the rest of the hair. Step 3: Spray a generous amount of water onto your hand using a spray bottle. Step 4: Run your hand over your hair a few times until the section is damp, but not too wet. Step 5: We will be using two of our fingers to act as our curling barrel. For tighter curls, use only one finger. 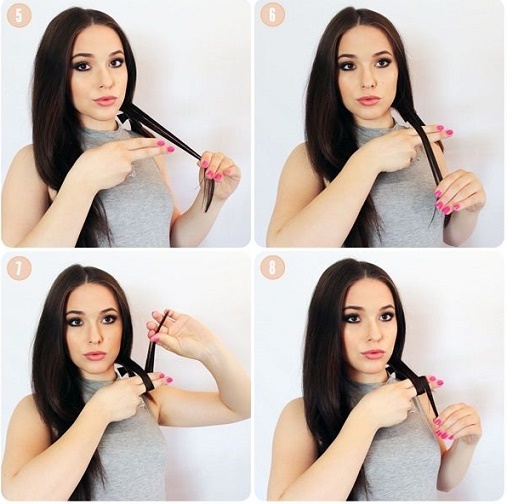 Steps 6-9: Wrap the damp section of your hair loosely around your fingers. Step 10: I will be using a combination of hair clips and bobby pins to pin my curls in place. Step 11: Gently pull the curl off of your fingers, holding its shape, and place a pin inside of it to hold it in place. Step 12: Continue with this same method in 1 inch sections on the rest of this half of hair, and spray on a generous amount of hairspray. 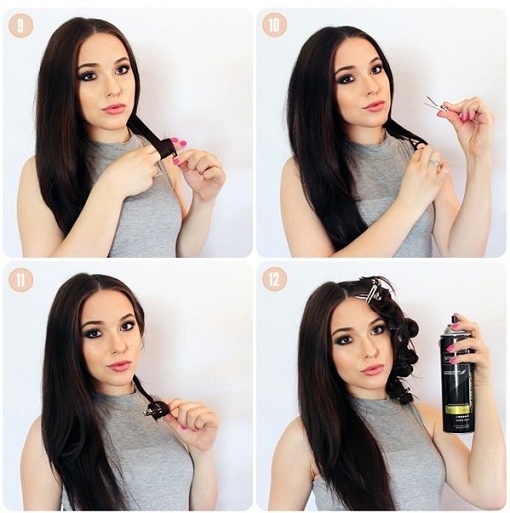 Step 13: Use the same method on the other half of your hair and spray with hairspray. 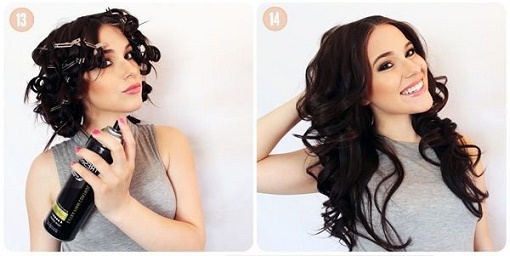 Let the curls set for 30-45 minutes or until dry. 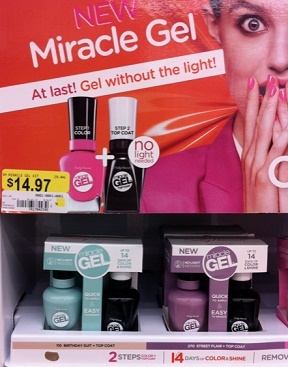 Must have: Sally Hansen's Miracle Gel Nail Polish kit. I am so tired of painting my nails and after a day or two, my hands look like I have been putting my fingers through a food grinder because the nail polish has chipped off. I am so in love with Gel nail polish because it last a very long time and your hands look perfect for weeks but who wants to go to the Nail Salon all the time and spend the money to have someone else paint your nails. So, I heard about Sally Hansen's new Miracle Gel nail polish that you can do at home and decided to give it a try. The best thing to do is buy the kit. In the package you get the nail polish and the top coat. Walmart had the kit for $14.97 which is a really good buy because the polish alone can run between $7.00 - $10.00 depending on where you buy it. The one thing is to remember when you are painting your nails is to do two coats because the first coat will have some streaking but after placing the second coat on, you will have the look as if your nails are professionally done. Now when using the top coat make sure your nails are 100% dry before using. After about a week of wear and tear the my nails started to look rough but that's great, a whole week of having beautiful nails is definitely a positive. And the bonus is when it comes to removing the polish it comes right off with one swipe of regular polish removal.